After much speculation, Nintendo's pre-E3 Super Smash Bros. video presentation today revealed Mii Fighters will be receiving their very own amiibo line. When used in the game, the Mii Brawler, Swordfighter and Gunner amiibo characters can be configured with custom faces and players' collected accessories and costumes. In addition to this announcement, Masahiro Sakurai detailed the next round of characters in the roster who will be available in amiibo form from September onward. 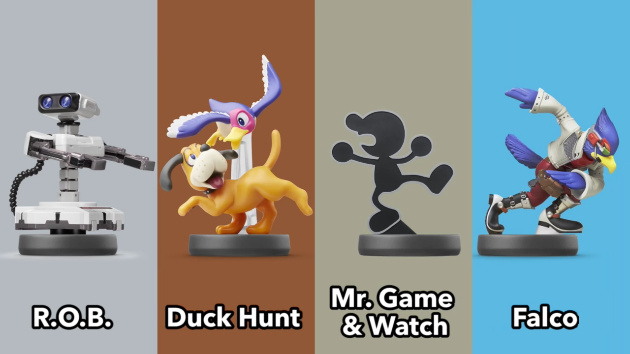 These include Nintendo icon R.O.B - with two variations (a Western edition and a Famicom themed figure for Japan), the classic dog and duck duo from Duck Hunt and Mr Game & Watch, who will come with changeable poses. Falco from the Star Fox series is also scheduled to arrive this holiday season, with Nintendo noting that every single playable character in Super Smash Bros. will eventually have a corresponding amiibo figure. 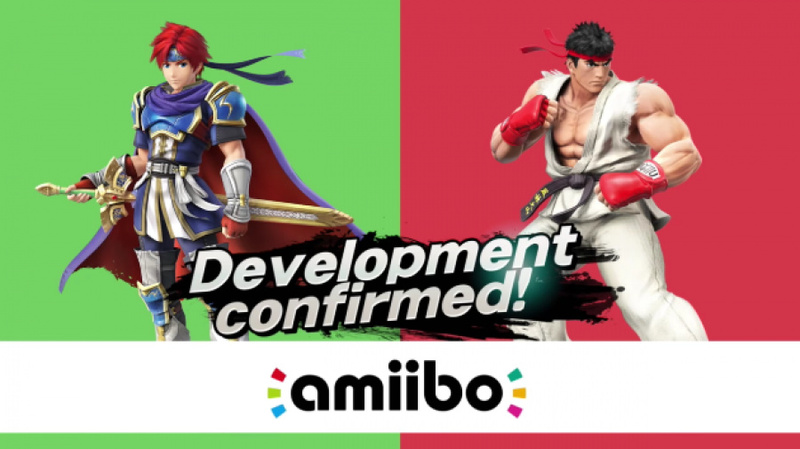 That includes the DLC characters Mewtwo, Lucas from the EarthBound series, Roy from Fire Emblem and the one and only Street Fighter legend, Ryu. Let us know in the comments what newly announced amiibo you're most looking forward to picking up on release. All of them. The recent ones that were announced today. I like Falco, but none of them are "must have" for me. Assuming I can track down a ROB and Duck Hunt (cause I'm sure those will have print runs in line with other such easy-to-find amiibo, like Little Mac and Marth...rubs temples) I'm all over those two. And I will probably get one or two of the Mii Fighter amiibo. Mewtwo as well. But I still need to get Dark Pit and Olimar. Maybe Dr. Mario and Bowser Jr. This holiday season is going to be fun yet chaotic with the new and restock amiibo coming out. Mewtwo and Roy to complete those series in the distant future and ZS Samus and Ganondolf for September. 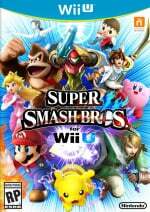 Maybe the Mii(s) if they can be used outside of Smash in a small unique way. I also hear that Japan is getting a different design for ROB based on the Famicon design. That would be interesting to see how importing will go. eBay owners must be happy whenever a new wave of these are announced. I was incredulous when he showed that pic of all the amiibo and was talking about collecting them all. They really should have marketed these from the beginning as "limited edition collectibles" if they were just planning on doing 1 batch of each and then moving on to the next batch. There are just too many at this point which aren't on store shelves. Wii Fit Trainer I can see getting a limited run, it's nto exactly Mario or Luigi, but so many others since then are selling out and not being replenished. And that's the real problem. Selling out is all fine and good - Splatoon sold out in Japan, but I bet there will be more copies of Spaltoon. But they need to start restocking old ones before making new ones. Just stop announcing new ones until stock of the old ones are readily available on shelves. I'll aim for ROB and Game & Watch (the changeable poses got me interested). As for the Miis, maybe Gunner but otherwise, meh. I want all of these amiibo, and that's a problem. I even want to get the Japanese ROBOT amiibo if possible. I am not even going to look forward to these cause it will only end in tears. @rjejr Exactly..and the amount of locked DLC is only getting worse with each new game that supports those uncommon (basically rare) amiibo. Just wait with new waves and give us a chance to buy the ones we want. I hate how they make collecting easy but completing a nightmare. I will buy 2 robs. 1 jp 1 us and duck hunt and maybe G&W. Curious about how G&W's poses will work. Will he just be bendy or what? I want a Ryu amiibo! Finally Falco. I'll grab that along Duck Hunt Duo and after that I only need Lucas and I've got every amiibo I wanted. Mr Game & Watch will be a joke if released under the same price tag as other Amiibos. This thing doesn't even use 1/3 of the plastic a regular figure would need. But it's Nintendo we're talking about... the same company that charges $5 for a crappy and $5 for a godly VC game. @rushiosan G&W will come with several different poses that can be removed from the Amiibo base. You can watch the video for more details, but I'm assuming that's how they're making up for the cost of production compared to the other Amiibos. OK Nintendo, you've had plenty of lead time to make Wave 6(?) Amiibos so supply had better not be an issue from here on out. At the very least there had better be a boat load of Ryu Amiibos for worldwide consumption. if your in Austrailia like me! amiibos dont ever sell out! and if there is a chance an amiibo does sell out, the wait time is like 5 days, and i can pre order the next 11 amiibos without no cancelled, so basically i can pre order like 5 a week cos i know i will get them! where as in America they sell out in like seconds! I want Falco to go along with my Fox. But I most definitely want Ryu. The big question will be, will any of us be able to get our hands on these, or will we have the same current problem. I know I'll never get a hold of it, but Game and Watch looks fantastic. Duck Hunt and.... RYUUUUUUUUUUUUUUU! THE BEST AMIIBO EVER! Oh all my childhood memories.... I even adapted that when I sneeze, instead of regular achhoooo I say "hadoooooken"
I wish! I like almost all of these newly announced amiibos but let's be honest; I'll probably never see any of these on the store shelves. Great. More amiibos that I won't be allowed to own.